I've got another fantastic nail art kit to share with you in partnership with Cult Cosmetics! 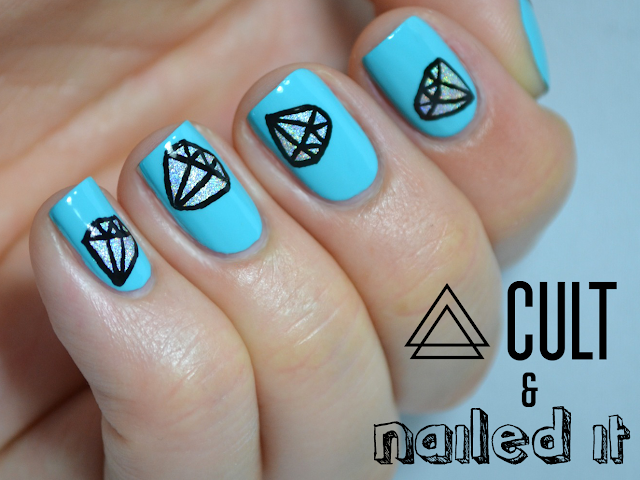 You may remember my diamond tutorial, and a sparkly look I created using it and some holographic polish. Well now, we're bringing you a full kit to get the look yourself! Check out the nail art kit, Katy's BFF, at the www.cultcosmetics.com! You'll get the holographic Color Club polish, Harp On It, another essie called In the Cab-ana, a black nail art pen, and an awesome nail art brush. This is beautiful!! Do they ship internationally?? Still loving this look - seen so many others try it but yours is the best! Everything you do is so awesome :D!